In the video, I don't particularly share anything helpful about the books, or anything at all. My main reason for purchasing them was because they were only one dollar each and there was free shipping, which I forgot to mention in the video!! Being awkward on camera and in general will always stick with me and I can't say that I am proud. Though I do find it a bit intriguing seeing how speak etc. when I am being recorded. Despite being awkward, I think that I'm actually more confident on camera than in person, HA. Aren't people normally camera shy? I feel as though I am sort of the opposite. I'm weird, I know. Gosh, my grammar and sentence variation is appalling! I must brush up on it or write a script next time xD This is how I am when I talk casually without thinking much :/ Thankfully my blog posts are not as bad haha. Enjoy! At first I was hesitant about sharing this haul video but Sue and Chloe tweeted me letting me know that they were interested in seeing it. It's thanks to them that I had the courage to edit and upload it! Apologies for the choppiness and background/loud noises. And also for the fact that it's not in HD. Yes I know, I need to get with the times or get a new camera!! 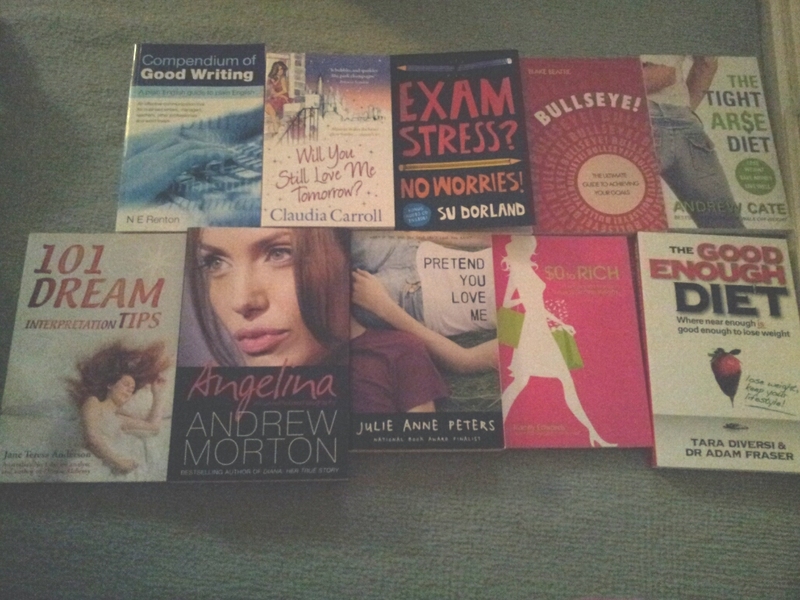 I bought 11 but I'm missing one from the haul because I gave it to my mum to read! EDIT: Umm I just realised that the books are no longer $1 each!! I think the promo ended at the end of July, sorry! I've finished reading the 'Exam Stress? No Worries!' book and I found it to be a great read. It was written by a psychologist and she explained why people experience anxiety before an exam and why others don't. This was really interesting and it made me think about my circumstances/upbringing and how they affect the way I tackle exams. It includes a lot of useful tips and advice e.g. relaxation techniques and some activities to complete. The student case studies in the book made me realise that exam anxiety levels can vary from person to person and after reading the book I now feel less anxious and worried about my exams than before. I would recommend this to all people who have exams and feel anxious about them. You are free to request a review from me for a specific book however I cannot guarantee that I will write the review or have one done anytime soon. I can keep it in mind though :) Or say a few words about it like what I have done above. No questjen of the week in this post but there'll be one in my next post. Plus I still have the one from last week's post [here] where I reviewed a pimple cream. I would love to hear your feedback on what you think of my videos and whether I should do more, or no more ahaha. Haha thanks Lisa ^^ Amazing indeed, especially considering that some of the books are at least $30 RRP and are only a few years old. Noted! I need to check booktopia out! Sounds awesome! Hehe thanks Ivy :) Aw I wish you had too! Will Using Rosehip Oil Benefit You?